Musts and wines from grapes affected by grey mould may contain varying concentrations of gluconic acid depending on the severity of the attack. In fact the enzymatic action of mould on grapes results in the generation of gluconic acid due to the oxidation of glucose. This situation leads to deterioration of the health status of the must and possible difficulties in triggering of alcoholic fermentation. Analysis sessions with multiple samples up to a maximum of 16 are possible. The correleation curve of CDR WineLab®, obtained using reference methods. Gluconic acid is phosphorylated by the action of a suitable enzyme in the presence of ATP. The adduct, formed through the action of NAD+, results in the formation of NADH in the ratio of 1:1 with gluconic acid present in the sample. The reaction, at end point, is measured at 366 nm and an increase in absorbance is directly proportional to the concentration of gluconic acid. For precise and repeatable analysis on the must, the sample must be degassed with the relevant ultrasonic bath and spun with the mini-centrifuge to separate the solid particles present in the solution. 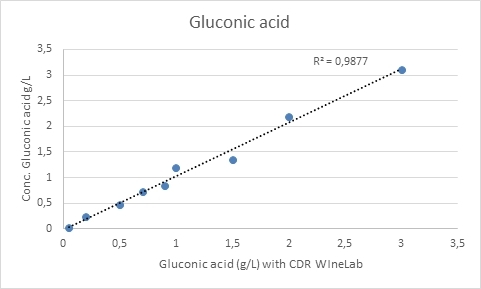 Gluconic Acid was last modified: February 8th, 2019 by CDR s.r.l.